With the latest summit "agreement" (assuming it gets off the ground) Germany will continue to increase its exposure to the Eurozone periphery. The nation's exposure will grow via its share of the ESM as well as the ECB who will be buying Italian bonds. That's in addition to what is already committed via the EFSF and its share of the IMF. There are also large direct exposures via the bilateral loans pooled by the European Commission (such as loans to Greece). And then there is the exposure that the media doesn't like to talk about because of the ongoing "debate". It is the Bundesbank's TARGET2 exposure, which just hit a record of about €700bn. 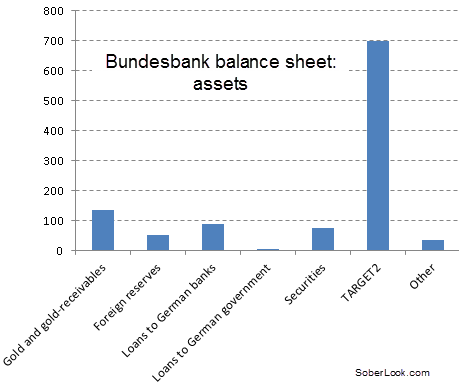 So what does 700 billion really mean in the context of Bundesbank's balance sheet? The balance sheet has grown as the exposure increased, right? 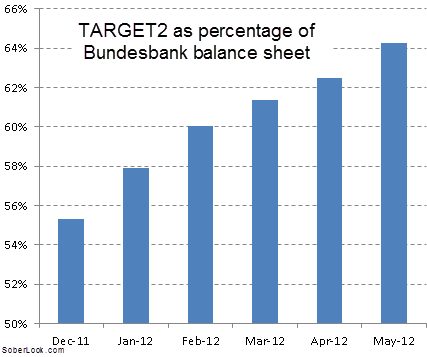 But the reality is that TARGET2 is becoming an increasingly dominant component of Bundesbank's balance sheet. Almost two thirds of the central bank's assets are now tied in this "debated" exposure. And as funds flow out of the periphery states, the proportion is only getting larger. 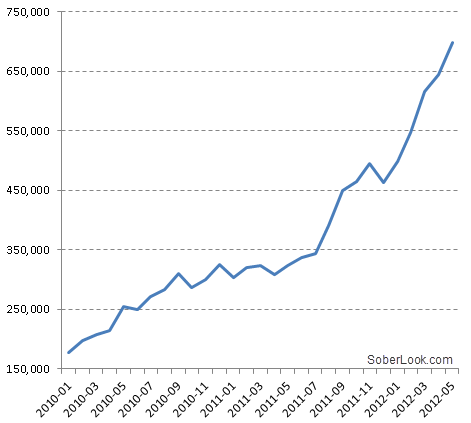 In fact it is beginning to dwarf all the other assets. So here is a question: if you were Jens Weidmann or the the Bundestag or Angela Merkel or the German public for that matter, and you were looking at the chart below of Bundesbank's assets, what would you think? But no need to worry because these are just accounting entries and as long as the Eurozone stays intact there is no risk.